History for Herlings as 2018 MXGP Champion while Jorge Prado Wins in the Netherlands. 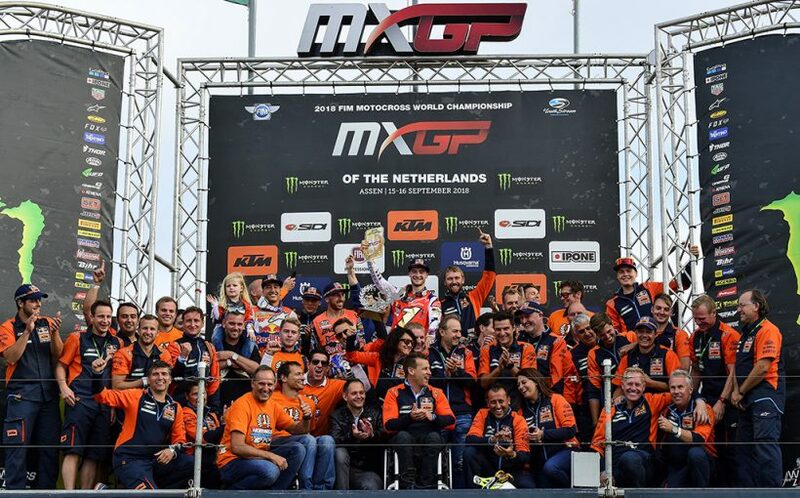 The most challenging season in the history of the FIM Motocross World Championship crowned Red Bull KTM Factory Racing’s Jeffrey Herlings 2018 MXGP Champion and overall winner today in Assen while Red Bull KTM Factory Racing’s Jorge Prado topped MX2. The MXGP of the Netherlands was the massive home stage for a handful of Dutch riders this weekend but none where watched closer than the now 24-year old Herlings. An electric atmosphere created by tens of thousands of MXGP fans filled the air at Assen, nicknamed the “Cathedral of Speed”. 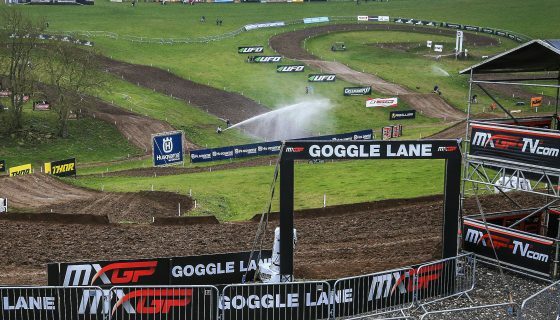 The venue has hosted some of the top motorsports athletes in the world as they made history and today was no exception. The magnitude of the event was not just evident by the massive crowd but also with special guests like the Minister of Sport for the Netherlands Bruno Bruins, the Mayor of Assen Marco Out, and many others watching the racing and taking part in the podium ceremonies. Red Bull KTM Factory Racing’s Jeffrey Herlings has been impeccable this season with 16 wins of the 19 races so far. 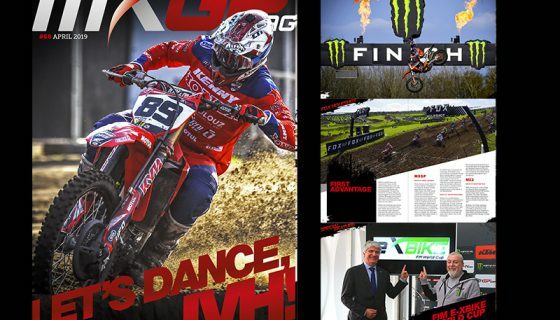 Today the life long dream of the “bullet” came true as he was crowned World Champion at the highest level of motocross, the MXGP FIM Motocross World Championship. Coming into race 1 Herlings needed to finish 16th or higher to clinch the title but off the gate his Red Bull KTM Factory Racing rival Antonio Cairoli took the FOX Holeshot. A test of Herlings’ mentality ensued and even with the option to let Cairoli get away, the Dutchman pushed forward. Giving chase to the two leaders was the third Red Bull KTM Factory Racing rider Glenn Coldenhoff. The second Dutch rider in the top three brought the crowd to their feet with the pressure of Rockstar Energy Husqvarna Factory Racing’s Max Anstie bearing down on the #259. Massive roars from the crowd were common but none matched the magnitude of those heard as Herlings took the lead away from Cairoli. Cairoli fought back immediately along the roller straight next to the grandstands but Herlings maintained the position. Lap after lap Herlings grew his lead over Cairoli while the Italian did the same to the rest of the field. Meanwhile Coldenhoff was still under pressure from Anstie for third and on lap 8 the Brit was finally past after a crash from the Dutchman. Also taking advantage of the misfortune for Coldenhoff was Team HRC’s Tim Gajser who moved from 5th to 4th. 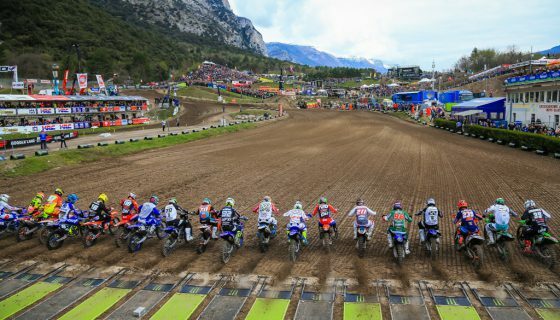 A strong start from Wilvo Yamaha Official MXGP’s Shaun Simpson positioned him 7th for the first 2 laps before gaining a spot on Monster Energy Kawasaki Racing Team’s Julien Lieber. Simpson was finished the race 6th as Herlings took an emotion charged and dominate race win lapping up to 7th position and earning him the title of MXGP World Champion for the first time in his career. The celebrations started immediately for Herlings who joined his team, family, and friends while Cairoli took second and Anstie third. MXGP Race 2 came just 2 hours later and Herlings lined back up with the new number 1 plate. 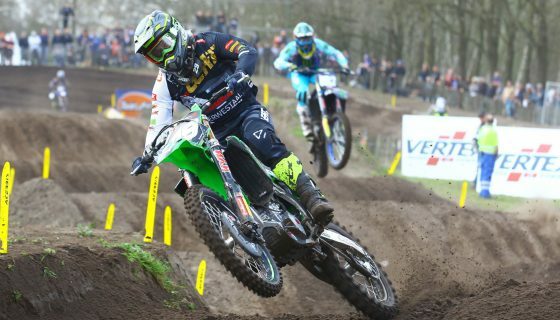 The Dutch crowd were again full of vigor as Coldenhoff took the Fox Holeshot. Herlings ran second while Cairoli was 5th but the Italian jumped to 3rd by the second straight. Herlings then made a rare mistake and fell while in pursuit of Coldenhoff for the lead. The fall dropped Herlings to 6th behind Anstie but only briefly as he jumped long to get by the Brit. Next on the running order for Herlings was Gajser but Cairoli was making successful moves for the lead on Coldenhoff. With Cairoli in the lead Herlings quickly dispatched both Gajser and Coldenhoff to reclaim 2nd. Anstie also moved by Gajser and closed on Coldenhoff the following laps. Herlings then lined up Cairoli for a pass but the Sicilian responded well to keep the new World Champion at bay. Not long after the pass attempt for Herlings lapped riders and bad line choice from Cairoli allowed the Dutchman into the lead. At the finish it was a massive victory for Herlings ahead of Cairoli, Coldenhoff, and Anstie. In the Overall standings it was a clear victory and strong finish to a perfect weekend for Herlings with Cairoli second and Anstie third. MXGP Race 1 Top Ten: 1. Jeffrey Herlings (NED, KTM), 34:42.385; 2. Antonio Cairoli (ITA, KTM), +0:38.961; 3. Max Anstie (GBR, Husqvarna), +1:08.037; 4. Tim Gajser (SLO, Honda), +1:10.886; 5. Glenn Coldenhoff (NED, KTM), +1:11.149; 6. Shaun Simpson (GBR, Yamaha), +1:18.646; 7. Gautier Paulin (FRA, Husqvarna), -1 lap(s); 8. Kevin Strijbos (BEL, KTM), -1 lap(s); 9. Clement Desalle (BEL, Kawasaki), -1 lap(s); 10. Julien Lieber (BEL, Kawasaki), -1 lap(s). MXGP Race 2 Top Ten: 1. Jeffrey Herlings (NED, KTM), 34:57.897; 2. Antonio Cairoli (ITA, KTM), +0:07.631; 3. Glenn Coldenhoff (NED, KTM), +0:40.172; 4. Max Anstie (GBR, Husqvarna), +0:41.933; 5. Tim Gajser (SLO, Honda), +1:12.454; 6. Shaun Simpson (GBR, Yamaha), +1:27.244; 7. Clement Desalle (BEL, Kawasaki), +1:44.321; 8. Gautier Paulin (FRA, Husqvarna), +1:53.877; 9. Jeremy Seewer (SUI, Yamaha), -1 lap(s); 10. Julien Lieber (BEL, Kawasaki), -1 lap(s). MXGP Overall Top Ten: 1. Jeffrey Herlings (NED, KTM), 50 points; 2. Antonio Cairoli (ITA, KTM), 44 p.; 3. Max Anstie (GBR, HUS), 38 p.; 4. Glenn Coldenhoff (NED, KTM), 36 p.; 5. Tim Gajser (SLO, HON), 34 p.; 6. Shaun Simpson (GBR, YAM), 30 p.; 7. Gautier Paulin (FRA, HUS), 27 p.; 8. Clement Desalle (BEL, KAW), 26 p.; 9. Kevin Strijbos (BEL, KTM), 23 p.; 10. Jeremy Seewer (SUI, YAM), 22 p.
MXGP Manufacturers: 1. KTM, 947 points; 2. Kawasaki, 664 p.; 3. Yamaha, 654 p.; 4. Honda, 640 p.; 5. Husqvarna, 610 p.; 6. Suzuki, 267 p.; 7. TM, 227 p.
The MX2 Championship coming into Assen was separated at the front by 24 points between Red Bull KTM Factory Racing’s Jorge Prado and Pauls Jonass. Yesterday’s Qualifying Race gave Prado the advantage with pole position. The first gate pick took Prado to his 24th Fox Holeshot of the year while Jonass crashed in the first turn. 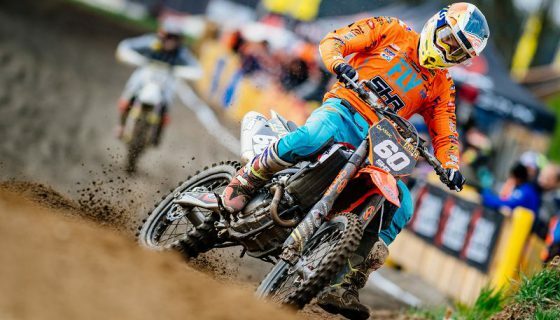 Prado had the lead stolen away by Honda 114 Motorsports Hunter Lawrence just before the waves on the opening lap and then came under pressure from Rockstar Energy Husqvarna Factory Racing’s Thomas Covington. Meanwhile Covington’s Rockstar Energy Husqvarna Factory Racing teammate Thomas Kjer Olsen fought over 4th with Kemea Yamaha Official MX2 Team’s Ben Watson. The Dane of Olsen took the spot and then moved on to catch Covington. Prado then took the lead from Lawrence in a switchback section by going inside to inside as opposed to the outside inside approach of the Australian. Lawrence then fell out a second time a couple of laps later which moved Covington and Olsen forward to second and third. Jonass was pushing his way through the field up into the top ten from the first turn crash. Covington lost 2nd to Olsen and then nearly lost 3rd to Lawrence but another mistake from the Australian gave Covington breathing room. Jonass eventually made it up to 8th after passing Hitachi KTM UK’s Conrad Mewse while Prado took the win with Olsen 2nd and Covington 3rd. MX2 Race 2 started in the same order for the top three as Race 1 finished with Prado scoring Fox Holeshot number 25 ahead of Olsen and Covington. Team HRC’s Calvin Vlaanderen had the Dutch crowd behind him as he passed Covington for third along the tribune and again several laps later as he took second from Olsen. Watson passed Jonass for 5th and held the position for 5 laps before the Latvian was back past. Jonass was unable to leave the #919 behind however and Watson made a pass stick with 3 laps to go. A lap prior to Watson’s pass Covington took over 3rd from Olsen after a mistake sent the Dane down. At the finish Prado took his second race win of the day with Vlaanderen second, Covington third, Olsen 4th, and Watson 5th. The overall result had Prado on top with 50 points while Covington took 2nd and Olsen 3rd making it the second consecutive MX2 round that Husqvarna has both factory riders on the podium. MX2 Race 1 Top Ten: 1. Jorge Prado (ESP, KTM), 34:14.374; 2. Thomas Kjer Olsen (DEN, Husqvarna), +0:06.207; 3. Thomas Covington (USA, Husqvarna), +0:10.027; 4. Ben Watson (GBR, Yamaha), +0:12.331; 5. Calvin Vlaanderen (NED, Honda), +0:23.068; 6. Hunter Lawrence (AUS, Honda), +0:29.770; 7. Michele Cervellin (ITA, Yamaha), +0:36.515; 8. Pauls Jonass (LAT, KTM), +0:36.858; 9. Conrad Mewse (GBR, KTM), +0:38.351; 10. Adam Sterry (GBR, Kawasaki), +0:43.764. MX2 Race 2 Top Ten: 1. Jorge Prado (ESP, KTM), 34:24.408; 2. Calvin Vlaanderen (NED, Honda), +0:07.591; 3. Thomas Covington (USA, Husqvarna), +0:15.909; 4. Thomas Kjer Olsen (DEN, Husqvarna), +0:18.212; 5. Ben Watson (GBR, Yamaha), +0:19.609; 6. Pauls Jonass (LAT, KTM), +0:26.899; 7. Michele Cervellin (ITA, Yamaha), +0:42.290; 8. Adam Sterry (GBR, Kawasaki), +0:48.350; 9. Jago Geerts (BEL, Yamaha), +0:50.004; 10. Hunter Lawrence (AUS, Honda), +0:51.541. MX2 Overall Top Ten: 1. 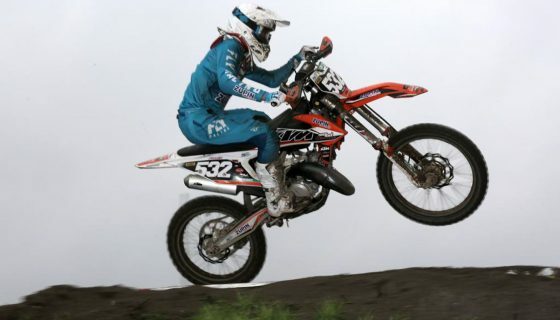 Jorge Prado (ESP, KTM), 50 points; 2. Thomas Covington (USA, HUS), 40 p.; 3. Thomas Kjer Olsen (DEN, HUS), 40 p.; 4. Calvin Vlaanderen (NED, HON), 38 p.; 5. Ben Watson (GBR, YAM), 34 p.; 6. Pauls Jonass (LAT, KTM), 28 p.; 7. Michele Cervellin (ITA, YAM), 28 p.; 8. Hunter Lawrence (AUS, HON), 26 p.; 9. Adam Sterry (GBR, KAW), 24 p.; 10. Jago Geerts (BEL, YAM), 20 p.
MX2 Manufacturers: 1. KTM, 918 points; 2. Husqvarna, 772 p.; 3. Honda, 662 p.; 4. Yamaha, 646 p.; 5. Kawasaki, 434 p.; 6. TM, 119 p.